Who Is Served By Safe Harbor Crisis Nursery? What Are The Reasons That Our Services Are Used? What Kind Of Difference Do We Make in Our Clients Lives? The Crisis Nursery serves a broad range of families with diverse family structures. Approximately two thirds of the families served are headed by single parents . Seventy five percent of the clients classify themselves as white. Of the non-white clientele, 60% are Latino. The majority of families served are economically disadvantaged. Nearly 75% of our clients earn less than $16,000. Many of the clients receive some sort of public assistance. A recent survey of the clientele found that 80% relied on the State Department of Social and Health Services, and 60% depend upon the federal WIC program for nutritional support. In addition to these governmental programs, nearly half of the clients are receiving some form of counseling and/or treatment through programs such as Safe Babies Safe Mom’s and Lourdes Counseling Services. The needs for the services provided by SHCN are as diverse as the clientele. 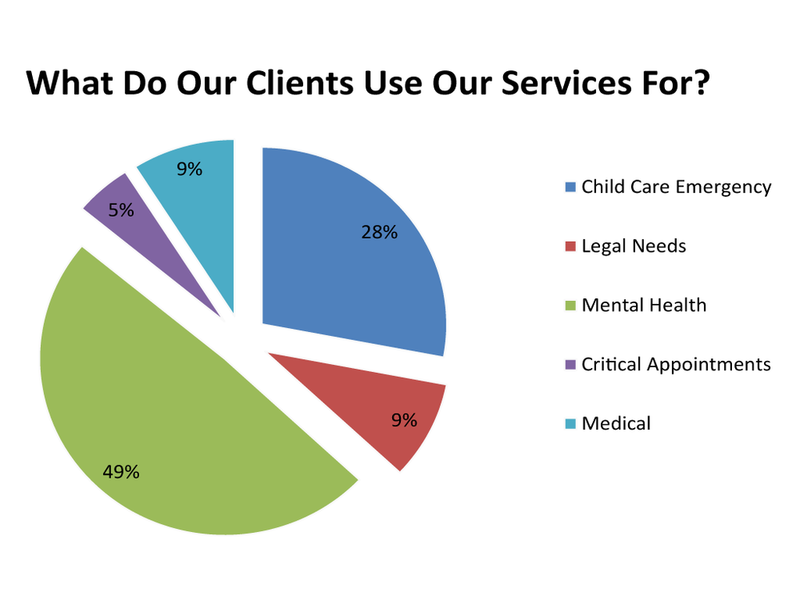 As the chart on the right demonstrates, nearly one third of all the clients use our services for emergency childcare. The preliminary results for our 2004 Quality Assurance Survey, shows the inability of SHCN’s clients to find “safe and reliable child care in an emergency” without Safe Harbor. This affirms the necessity of our services to the community. I have no other option and they never turn me away. The second most important reason for use of the services we provide is to allow parents to go to work. This critical service enables the clients to move towards self-sufficiency while ensuring adequate care of their children. In addition, SCHN offers care for children whose parents need vital mental health treatment or intervention. Without this service, a crucial component enabling clients’ transition to stability and independence in their lives would be lost. Safe Babies Safe Mom’s, a program of the Benton-Franklin Health District, partners with SHCN to provide their clientele childcare while they participate in that program’s support groups. The preliminary results for our 2004 Quality Assurance Survey have shown that our clients are very satisfied with our services. All of the respondents felt strongly that SHCN treated them with respect and provided exceptional care for their children. Safe Harbor Crisis Nursery has been there for my girls and me. I feel that my girls have been well taken care of. Our clients were satisfied with SHCN hours of availability and all felt that they received the support that they needed. Safe Harbor Crisis Nursery’s most valuable service has been their care and help with my child. Safe Harbor Crisis Nursery betters the lives that it touches. There are still more lives to be touched and Safe Harbor’s goal is to serve these new families. The survey (en español) used for clients to fill out their impressions of SHCN. Of the 31 clients that were sent out information, only 11 sent back responses. For each of them that sent back information, the data was compiled into an excel document. To help keep the survey information clear, a blank survey was created using numbers for each of the questions. The data was compiled (Google Documents) and the above report was written. You can also see the final report created for this project.